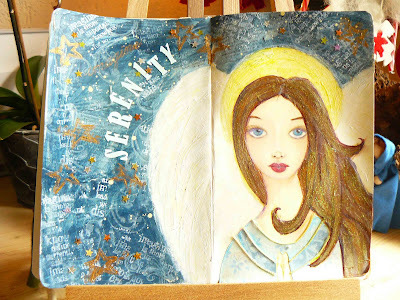 So this is the final result of my first angel in my new Moleskine art journal! I added a couple of more layers with paint, lettering, stamping, ribbon and stars. For the last couple of days I'm working on 2 angel paintings on wood. One traditional angel and one primitive angel as Suzi likes to call them. The primitive one is like the "les petits dolls" class I did last year. I finished the woodburning and have to start painting. The traditional angel is halfway. I won't have a lot of time painting in the next week or so because I'm making some changes to my house. I'm going to swop my bedroom upstairs with my scrapbookroom downstairs. It'll be a lot of work!! I'm so glad that Cor is coming to help me!! My son is going away for some time because he doesn't like to be at home when I have to make alterations to the house. Anniek wat maak je toch prachtige dingen!! Leuk dat ik nu ook jouw blog heb gevonden (hij staat al bij mijn favorieten dus vanaf nu komt het goed) Ik wens je fijne feestdagen en hoop dat je al je geliefden rondom de tafel zult hebben! !